Lakewood in East Dallas, Walnut Creek Estates in Lake Highlands, Royal Highlands Village in Lake Highlands, Bryan Place, Highland Hills, Wilshire Heights, Highland Meadows, Lake Ridge Estates, Scyene, Lake Ridge Estates in Lake Highlands, White Rock Valley, Merriman Park, and many other brands in Far North Dallas. Metroplex Tech Dallas Fort Worth Virus Removal offers on-site computer virus removal that completely eradicates even hard-to-remove computer virus infections. If you suspect that you have a computer virus, please contact us at (817) 717-5539 so we can help. We clean virus infections from desktop PCs, laptops, personal and business computers and servers. We work on all popular PC brands such as Compaq, HP Hewlett Packard, IBM Lenovo, NEC, Toshiba, Alienware, Dell, eMachines, Gateway, Acer, Sony and many more. 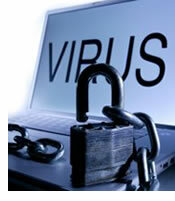 Metroplex Tech offers expert virus removal and virus protection services. Please contact us to remove a virus from your PC. Do not open any files attached to an email unless you have an anti-virus program that checks it first, even if it appears to come from someone you know. 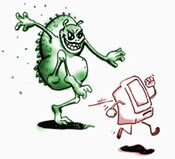 Some viruses can spread through email. Delete chain emails and junk email. Do not forward or reply to any to them. These types of emails are considered spam and can contain trojans and other intrusive malware. 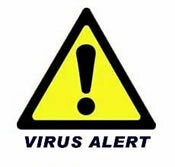 Do not download or copy any files from another computer or external drive or flash usb drive without checking it first with anti-virus software, as it can contain viruses. Exercise caution when downloading files from the Internet from unknown or untrusted websites. Ensure that the website is a legitimate and reputable one. Make sure you use an anti-virus program to check any downloaded files before opening. Update your anti-virus software regularly. Hundreds of new virus threats are discovered each month, so stay protected by keeping your anti-virus program and definitions up-to-date. Back up your files on a regular basis. If a virus damages your files, at least you can recover them with your backup copy. You should keep your backups separate from your computer, such as on CDs. When not sure about something, take caution and do not open, download, or execute any file or email attachment. Keep your computer operating system and programs up-to-date and free of vulnerabilities that can be exploited. Microsoft Windows has an automatic update feature that can keep your PC updated with all the current patches and fixes. (Internet is required). Computer Spyware removal and cleaning services. Spyware and adware are both forms of malware. While not a high risk to your computer files or programs, they pose a great threat to your privacy. The purpose of the spyware is usually to continously monitor and track what you do on the Internet. This is done secretly in the background without your consent in most cases. The information collected is sent to the source of the spyware or adware. Spyware is one of the largest threats to personal information. The worst forms of spyware compromise the confidentiality and integrity of the entire computer. Over time, a computer will become so slow from spyware that owners will go buy a new one. Consumer Reports stated in the September 2006 issue that nearly a million U.S. housholds did just that. Total damage from spyware is estimated at $2.6 billion. 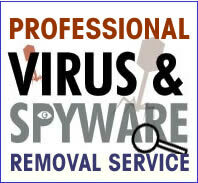 We offer professional virus removal and virus protection services. We support these and other anti-virus programs and packages. McAfee anti virus, McAfee virus, McAfee virus scan and microsoft anti virus. Norton anti virus, Norton anti virus, Norton anti virus software, Norton virus protection, Norton virus scan, Nortons anti virus, online virus scan and Panda anti virus. Remove trojan virus, spyware anti virus, spyware virus, Symantec anti virus, trojan virus, virus protection, virus protection software, virus removal, virus scan, virus scanner, virus software, Vista anti virus, Yahoo anti virus and Yahoo virus protection.